According to oral history, Chi-ne-ka (a Cree name) had a Cree bloodline. As an adult, Chi-ne-ka and his young wife fled their Cree tribe in the Bear Hills near Battle River because several of his tribesmen had tried to kill him in order to steal his exceptionally beautiful wife. Chi-ne-ka encountered a group consisting of several clans of the Ĩyãħé Nakoda that were camped at the foot of Ĩyã Mnaθka (flat-faced mountain). It was mid-summer and the group was preparing for a big hunting and camping circuit along the upper Bow River and Bow Fort Creek. By sign language, Chi-ne-ka gestured he had come in peace. Some of the older members of the encampment were multi-lingual and Cree was one of the languages they could speak in addition to their native tongue. Chi-ne-ka told the Ĩyãħé Nakoda he had just shot some choice elk that were gutted and dressed. As an expression of friendliness, he offered to give the elk to them. Chi-ne-ka then asked if he and his wife could take sanctuary in their camp. 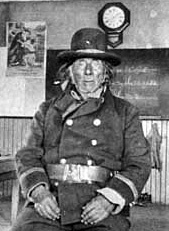 He declared that he could serve the Ĩyãħé Nakoda well. He would prove himself worthy by hunting and providing them with an endless supply of fresh meat. They agreed to this arrangement and Chi-ne-ka and his wife stayed. Weeks turned into months. Chi-ne-ka continued to earn his welcome with the Ĩyãħé Nakoda. In the ensuing years, the Ĩyãħé Nakoda recognized that he had a special talent: Chi-ne-ka had the unique ability to resolve disputes and to broker peace. Also signing Treaty 7, representing their respective Ĩyãħé Nakoda groups, were Ožĩja θiha (Bear Paw) and Ki-chi-pwot (a Cree name). Written beside their three marks were the words: "Stony Chiefs". Since that time, the Ĩyãħé Nakoda group led by Chi-ne-ka was known as "Chiniquay Band" and since the 1980s as "Chiniki Band". After Treaty 7 was signed, the Chiniquay Band was contained on the Morley Reserve together with the northern and southern Ĩyãħé Nakoda groups. Regarded as a man of even temper throughout his Chieftainship, Chi-ne-ka died on the Morley Reserve in 1906.